1. Preheat oven to 350°. Spray a cookie sheet or aluminum tray with cooking spray. 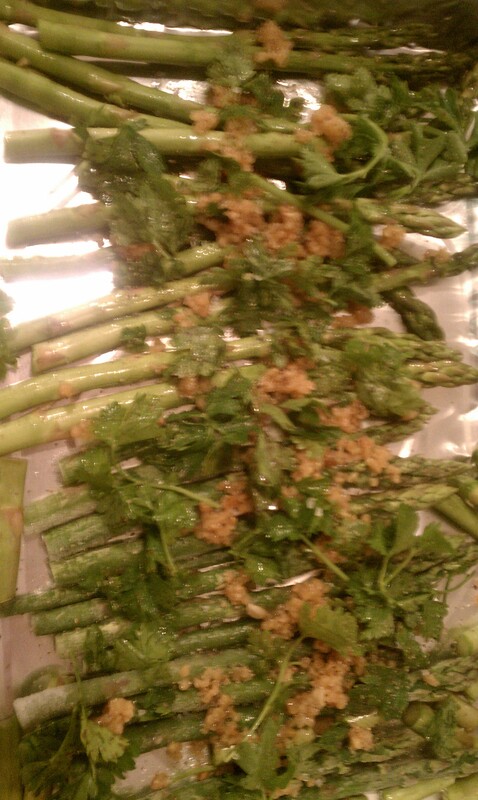 Trim asparagus ends and place the stalks side by side on the tray, single layer. 2.Cut the lemon and squeeze the juice over the stalks, distributing evenly. Sprinkle with salt and pepper. Drizzle with olive oil. Sprinkle over the cheese and parsley. Top with the chopped garlic. 3. Pop in the oven for 25 minutes. Voila! Your new favorite side dish. * Quick Kitchen Tip: To remove the smell of garlic from your hands, rub your hands up and down a metal faucet while running cold water over them. As crazy as this sounds, it works! 4 Responses to "Garlic-Parmesan Asparagus"